Many eco-conscious individuals are interested in composting food waste, but are reluctant to incorporate composting into their lives for a myriad of reasons. Compost heaps can be laborious. It takes a fair amount of time and effort to maintain a healthy compost heap. You must churn the compost to aerate the pile. Traditional compost piles can also take up a lot of space and you must constantly monitor the pile for a proper brown (carbon) to green (nitrogen) compound ratio. Worse yet, a compost pile can become a disgusting, smelly, maggot-ridden mess if not given the proper care. For these reasons, many individuals and families decide against composting. If you are apprehensive about composting where you live, there is a far easier, less smelly and less insect-ridden option: anaerobic fermentation. Anaerobic fermentation is like composting, but without oxygen – which, consequently, is at the root of most of the problems that people experience with composting. Rather than relying on oxygen-rich decomposition, the organic matter is broken down without oxygen via fermentation. Anaerobic fermentation is an alternative to traditional composting. Unlike composting, anaerobic fermentation is a preserving process – meaning matter is not broken down and nutrients are preserved in bio-available forms for plants. While not technically compost, the fermentation process achieves similar desired results – organic material is eventually broken down to produce a desirable end product that builds soils that grows vigorous plants. In the case of fermentation, the final product is a nutrient-rich humus, the perfect slow-release organic fertilizer for gardens. Fermentation is different than compost in that it does not produce foul smelling gases and is in general far less attractive to unwanted insects or flies. It also does not require any turning of piles so it is virtually maintenance-free! Anaerobic fermentation utilizes a specific set of anaerobic organisms found in EM•1® Microbial Inoculant that stabilize nutrients such as ammonia and convert it to amino acids, the building blocks for proteins and vitamins. The good microbes produce dozens of enzymes as well that accelerate various chemical reactions in the soil, including polysaccharide synthesis (glues that hold soil particles together and retain moisture for drought tolerance). In this antioxidant-rich environment pathogenic organisms cannot survive and beneficial organisms thrive. As good microbe populations grow and added directly to soil, they provide a source of food for worms. Worm eat microorganisms. They also secrete various substances that control pathogens and hold soils together as they drill through soil layers, aerating the soils as they hunt for food. What’s the Easiest Way to Start Anaerobic Composting? 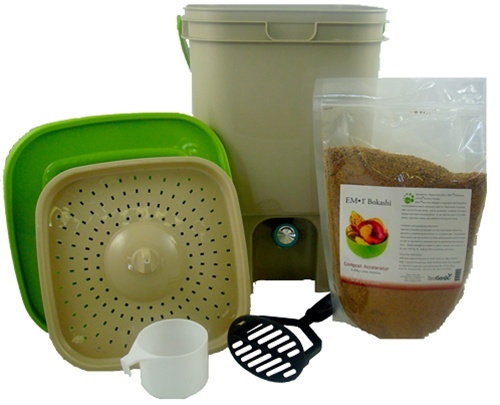 EM•1® Bokashi is perhaps the easiest, most trusted and reliable method of anaerobic composting for the home. Bokashi is Japanese for “fermented organic matter,” and while it is commonly referred to as a type of composting, in truth it is technically anaerobic fermentation. Bokashi powder on its own is simply a fermented wheat bran powder that enables the fermentation process, kind of like a starter culture. EM•1® Bokashi is a more effective mix of organic rice bran, and beneficial microorganisms including fungi and bacteria, which promote a healthy fermentation environment and accelerate the compost process. What’s so Great About EM•1® Bokashi? It is easy, requiring far less attention and virtually no churning. It is faster than traditional composting – several weeks as opposed to several months. It is almost completely odor-free and does not attract flies and subsequent maggots, rats, etc. It takes up very little space – all you need is a bucket (or two so you can rotate between the two), though it can be increased to a larger scale if needed. You can use EM•1® Bokashi on all food wastes including dairy and meat.